Doesn’t she look radiant? How amazing that two unexpected and inexpensive gifts of sleepwear and wildflowers can make our favorite grandma so happy. Such is the power of love. Or, more specifically, the power of a grandson’s love. But what makes the above image even more special is that by himself the grandson isn’t sure what to buy for the grandmother. He has known her all his life, yet it is someone else who shows him which are the more meaningful gifts. This someone, who just a few months ago was still a stranger, understands the elderly lady better than he does. True enough, the gifts move the grandmother to tears. Hwan’s willingness to follow Eun-sung’s judgment and to TRUST her makes this another standout episode. When I look at Hwan’s relationship with Grandma and Eun-sung, I am reminded of a Chinese legend. Call it destiny or whatever, but the idea is the same. Eun-sung is the woman Hwan has been waiting for his whole life. He needs her, and she completes him. Because of this red thread between them, Hwan will have an inexplicable bond with her lost brother (illustrated powerfully in the above image). Because of this red thread, a grandma and her grandson will choose to believe in Eun-sung despite the damning evidence presented by a witch and her witchling. This episode is about following your heart even when your head disagrees. At the end of Episode 19, we see Eun-sung packing her belongings and leaving the house. No one runs after her, at least not immediately. Hwan’s mom, not content with the stinging slap she administered earlier, is still scolding the absent Eun-sung even as Jung nods along. The rest remain silent. 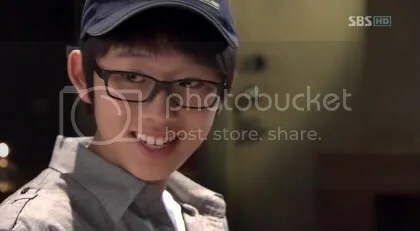 You know, I’ve been so charmed by Hwan’s transformation it didn’t hit me until this episode that his mom and sister have remained the same. Granted Eun-sung entered their lives and turned it upside down, resulting in the two experiencing more hardship in a month than in the last twenty-five years (Jung’s age). Granted Hwan’s mom has known the witch for more than three decades. It’s thus only natural that she believes her rather than Eun-sung. Still, it’s disappointing to see her and Jung treat Eun-sung with so much contempt. Every day that she’s lived with them, she has gone out of her way to be polite and accommodating. When the household’s busy, like at the memorial ceremony, she immediately chips in to help. Yet in all this time they have not warmed to her, not even in the slightest. Is that a flaw in the writing, to make them incapable of change? With just eight episodes to go, what will it take for them to accept and even like her? But let’s not concern ourselves too much with foretelling the future. What matters right now is that Hwan has just run out after Eun-sung. I’m glad that he didn’t go after her immediately. As we will see in this episode, trusting someone isn’t something that comes naturally to our Hwan. Moreover, the witch and Seung-mi are so convincing, what if there’s an element of truth in what they claimed? I’m glad that he sits there in the living room at first, his head bowed, trying to make sense of everything that has unfolded so rapidly. Because he has doubts and he mulls over them, we know that when he eventually makes up his mind to trust Eun-sung, that it will be an abiding trust. Stop there! he yells. Why aren’t you saying anything? Is it true that you knew about Grandma… and about me? If you don’t refute their allegations, it means what they said is true! Will you believe me if I say it’s not true? Will anyone believe me? How disgusting is money… and how scary. I hate it all. I want everything to stop. I love this image. As Eun-sung leaves and Hwan stands there gazing at her, a tree stands between them. The tree isn’t a sapling; it’s tall with a fairly thick trunk. Yet the supports around it betray its young age. Even though the tree is growing sturdily, it isn’t yet strong enough to withstand the weather elements. The supports will protect it and help it grow even stronger. In the same way, Hwan and Eun-sung’s relationship is growing, even as it remains fragile. He will turn to two people — one elderly and the other just a teen — for the support that he needs to keep himself strong. She, on the other hand, has two best friends who know her… and trust her. Wherever her heart takes her (and it’s just a matter of time before they find out how she feels about Hwan), she knows she can count on them to always be there for her. On the bus taking her back to where she used to live, Eun-sung’s heart feels like it is breaking. More unbearable than the allegations against her is the thought that Hwan and Grandma might believe them. That hurts more than anything else. The next morning, she awakes to the sight of Jun-se and Hye-ri sitting next to her. He chides her gently. Why didn’t you tell me about your relationship with Seung-mi? If your stepmom can abandon Eun-woo so callously, you should know she’s capable of doing anything to protect her own interests. Not everyone is kind-hearted like you. I can’t remember if we were told in a previous episode what Jun-se studied. (Not my fault for being scatterbrained. Research confirms it’s technically impossible to swoon and read subtitles at the same time.) But Hye-ri tells Eun-sung that Jun-se majored in law, so he’ll know what legal recourse they can take to prove Eun-sung’s innocence. But Eun-sung is too battered right now to think about getting back at the witch. There’s no hope, she tells Jun-se and Hye-ri wearily. Eun-sung prepares her resignation letter and gives it to Grandma at the head office. But the latter tears up the letter instead. Do you know how embarrassed you’ve made me? Do you think you can just resign and go away? I can’t even trust myself, so how can I trust you fully? Show me. Prove to me that you are capable of raising revenues and running the second branch. And don’t try reasoning with me about not wanting the inheritance. I’m the one who will worry about that, not you. As far as Grandma is concerned, at least outwardly, nothing has changed. She and Eun-sung had a pact and both must fulfill their end of the deal. But Hwan doesn’t know that. All he knows is that Eun-sung isn’t at home anymore and he misses her. As he leaves for work, he sees her bicycle on the patio. It’s so sweet how he touches the saddle, remembering the many times she’s sat on it and that one time she sat behind it, her arms around him. If anyone doubts that Eun-sung likes him, he will recount her embrace that day. How tightly she held him! For the first time since he started work at the second branch, Eun-sung isn’t there. Not greeting customers in her cheerful way, not wiping the tables, not taking a rest up on the rooftop. Eager to get at the truth, Hwan meets with Seung-mi. The witchling had earlier bumped into Eun-sung at the head office as the latter was leaving after her meeting with Grandma. 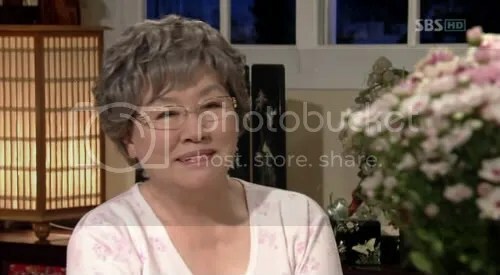 Insisting that all the allegations against Eun-sung are true, Seung-mi adds: I will protect what is rightfully mine. But what if that person likes me? What if he trusts me instead? Moreover, has that person asked you to marry him? That apology should convince him how sincere she is, but Hwan isn’t as gullible as Seung-mi hopes. He dismisses her claim that Eun-sung is a fraud. Even if I seem disinterested in what’s going on with people, I’m not lacking intuition or perception. I’ve spent a lot of time with Eun-sung. She isn’t someone who will resort to threats. This whole thing could just be a misunderstanding. Leaving Seung-mi indignant and in tears, Hwan goes off to his friend’s wine bar. He has something he needs to ask Piano. Our music prodigy surprises Hwan by looking absolutely delighted to see him. 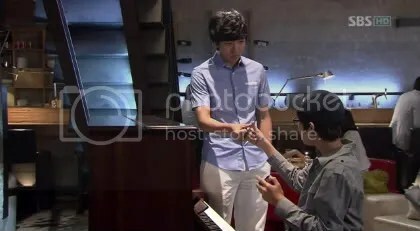 Piano (aka Eun-woo) reaches out his hand to do a pinky swear — a tacit acknowledgement that he will not divulge Hwan’s confession about liking a girl called Spy. Hwan instantly understands his gesture. It’s the encouragement he needs to speak what has been troubling him. I’m in a major dilemma. Do I follow my head or my heart? My head tells me that Spy is a bad person, but my heart says Spy’s a good person. Piano’s answer? Spy’s a good person! Hwan looks at Piano in wonder. Hmm, how can this boy be so certain about a person he has never met? Maybe he also possesses intuition and perception? Must be. Jun-se is beaming when he sees Eun-sung. Our angel isn’t just head over heels in love, he’s happy whenever he’s able to help her. This time he tells Eun-sung that they will need to sue her stepmom in order to recover the insurance money. That will prove Eun-sung’s innocence. His lawyer friend will take up the case and she can pay him when the court awards the case in her favor. Jun-se’s initiative fills Eun-sung with hope. At least things aren’t as helpless as they had appeared last night. 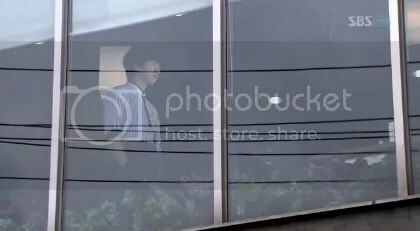 Returning to work the next day, Eun-sung is walking hesitantly toward the second branch when she looks up and sees Hwan standing near the glass walls on the second storey. He is deep in thought at first and does not see her. Then he turns and their eyes meet across that glass expanse. Ah, another scene that I love. Another reason why Brilliant Legacy gets more awesome by the minute. The writing and direction are first-class. As he’s standing up there, a bird flies above Eun-sung and is reflected in the glass, right across Hwan’s silhouette. It’s blink and miss, but I saw it. Birds in flight always fill me with an unexplainable sense of joy and optimism. Our wonderful manager (please clone and despatch him to every Jin Sung branch!) jokes about Hwan functioning like a robot without batteries. At that moment, who should walk in but the “batteries”; you can almost hear Hwan’s inner machinery revving the moment she appears. Eun-sung tells Hwan tersely that she needs to talk to him. He follows her up to the rooftop terrace, his eyes fixed on her back but turning abruptly away whenever she looks in his direction. He does it so often in this episode it’s a wonder he does not get a crick in his neck! She tells him that she’s back at work and he asks if she made another deal with Grandma. I’m not telling, she says. Fine, I don’t want to listen anyway, he snaps in pretend aloofness. But what Eun-sung really wants to know is whether he saw her necklace. The answer, as we expect, is no. How can a battery-less Hwan spot something so small? You should buy something for Grandma, she urges. Then help me pick a gift, he replies gruffly. Passing a jewelry store, Hwan stops when he sees a necklace with a small heart pendant. That’s expensive and won’t please Grandma, Eun-sung says, not realizing he’s staring at it for another reason. It’s more practical to buy innerwear, she says. So to a lingerie store they go. Just the kind of place Hwan enjoys (not!). Look at him squirming like he has never seen female underwear. C’mon, Hwannie! You’re the only guy in your family; haven’t you seen these things flapping on the laundry line at home? Or is it because you are seeing them with Eun-sung? You’re so comical with your nose in the air. Why not act like the cool and unruffled guy you normally are? Feel the fabric, help her choose! After buying woollen sleepwear for Grandma, their next stop is the florist. Hwan suggests roses (because don’t all women like roses? ), but Eun-sung knows better. She has seen Grandma returning with armfuls of wildflowers during that one week they were staying together. Wildflowers remind people of their past. They are comforting to old people for whom memories are so important. The gifts bought, Hwan tries to prolong their “date” by asking Eun-sung to have dinner. You helped me choose the gifts, so it’s my treat. But she declines and he goes home dejected. The next scene is really sweet. For you, Grandma. For you, Mom. Nothing for you, Jung. His sister gives him the glare of death, but his grandmother and mom greet their gifts with delight. Grandma is especially moved. Cradling the flowers like they are a newborn, she can’t stop smiling… and crying. How thoughtful of Hwan! He even knew exactly the right colors to pick for the wildflowers! Remember how Eun-sung bought gifts for everyone when she received her first paycheck? Well, not for Hwan (I think), but that was because he owed her money. Our butler still wears the bandana that Eun-sung bought him. Butler Pyo and Hwan’s mom are in the kitchen when he receives a strange call. It is just Hwan acting all secretive, asking the butler for Eun-sung’s address. 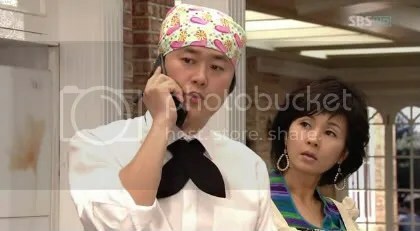 Our man in the cute bandana answers in just as cryptic a manner, not realizing Hwan’s mom thinks he’s talking to an “older woman” date. Hwan then dashes out, reaching the jewelry store just as it is about to close for the day. Aww… he’s going to buy that heart necklace for Eun-sung! Because he needs an excuse for showing up with the necklace, Hwan decides it’s a good opportunity to return Eun-sung her bike as well. So he wheels it out of the house, nonchalantly at first, hoping no one notices that’s a pink girly bike he’s pushing. But bikes aren’t meant to be walked like a dog, so Hwan gives up and hops on it. Wow, without Eun-sung behind him, the guy sure cycles like a pro, shoulders forward, the wind whipping his hair. Using the address that the butler provided, Hwan finally finds Eun-sung’s house. But instead of knocking on her door, he leaves the bicycle in the garden, the necklace hanging from the handlebar. Eun-sung is surprised to see her bicycle. Who brought it there? And what’s this, a card and a necklace? There isn’t a sender’s name on the card, but Eun-sung and Hye-ri don’t need to second-guess. The words on the card have the unmistakable Hwan stamp on them: I couldn’t find your necklace. What kind of girl has only one necklace? Like the true pal and loyal employee that she is, Hye-ri is immediately upset. Why is Hwan giving Eun-sung something so personal? Why is Eun-sung in tears? When did this all start? It’s not right. Jun-se is the one for Eun-sung! He’s done so much for her. Moreover, Seung-mi and Eun-sung used to be sisters. Eun-sung can’t take Seung-mi away from Hwan! I know, Eun-sung says. It’s not like what you think. 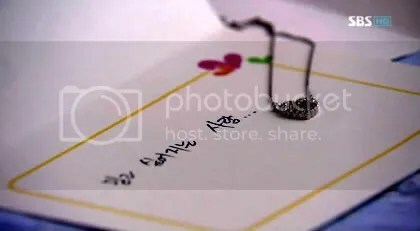 Alone that morning, just before leaving for work, Eun-sung looks again at the necklace and the card. Remembering the anonymous feedback card that the second branch’s employees had written to each other, she takes out the one with the same handwriting as Hwan’s card. Even though it was written weeks ago, it’s as if he is speaking to her now. With no one to see her, Eun-sung breaks down. Gratitude that he trusts her. Sorrow that his trust isn’t going to be enough for all the obstacles between them. But soon she must dry her tears. It will not do for Hwan to see her like this; they still have that church contract they need to clinch. Good news! the manager says. No cleaning at the church today. Just go and sign the contract. 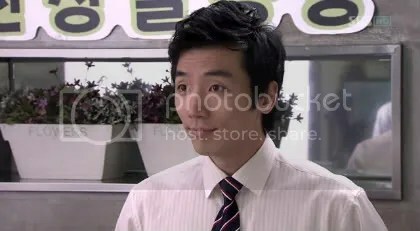 The catering contract with the church signed, Eun-sung tells Hwan that they need to celebrate. Unknown to him, she has something to tell him… and something to return. We know by now that our girl has perfected the art of smiling even when her heart is breaking. So she takes him for drinks and snacks, her playful manner a mask. Wow, you sure can drink, Hwan says. Of course, she replies, I’m my father’s daughter. As if the soju is loosening his tongue, Hwan tells Eun-sung that his father was a good drinker, too. Then tell Grandma. Tell her how your dad died trying to save you. Why are you angry with yourself because of this? Grandma would have done the same thing. You’re not a bad person because of that. And… I apologize for turning your life upside down. I don’t want that to go on anymore. This necklace… You’re not going to spend the rest of your life with me, so I’m returning it to you. I love this scene of Eun-sung walking home, her hands caressing the craggy wall, her tears falling. Returning the necklace to Hwan is her way of telling him that the path they must walk is different; they can’t be together. But why does it hurt so much? At home, she tries to throw away his second card to her. But she doesn’t have his necklace anymore and to discard this as well is just unbearable. So she retrieves it, trying to smooth over the creases. And then she hears banging on the door. Bang, bang, bang. His voice yelling her name repeatedly. She opens the door. He stumbles in, smelling of soju, falling right on top of her. And thus ends Episode 20. That last scene above will be discussed at length on the next recap. Second, isn’t this episode chock-a-block with new developments? I left out many details and still this ended up being so long. (Notice I did not include a single image of the witch? Bwahaha.) Btw, I watched Ep. 24-26 last night and boy, talk about things happening at breakneck speed! Third, I’m trying hard to catch up with the recaps and hope to post two more this week (ep 21 & 22). Then three more next week and three the week after. *fingers crossed* Then we are done, sob! Gonna miss this awesome drama so much. Thanks to your enthusiasm, I’m now downloading the drama. Not watching yet as I’m waiting for the subs to be completed. In the meanwhile I’m parking myself here to read your recaps. Oh mah gawd, Lee Seung Ki really DOES resemble Oh Man Seok in that cap! 😮 My fondness for him actually just rose a couple of notches. Oops? I actually like that Mom and Jung remain rude to ES. ES is barely in the house interacting with them. Perhaps dinnertime and breakfast, but other than that, Hwan and Granny are the only ones who get the benefit of actually associating with her. 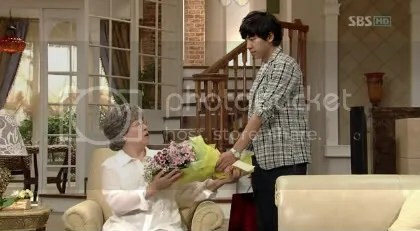 Plus, in Mom and Jung’s eye, ES is someone who takes away their inheritance, no more. So it was reasonable for me that they reacted that strongly to her being ‘outed’. BTW, Thundie, you should win a Screencapping Award. Your Junseh caps don’t look even human, he looks godly in them. But that may just be the Bae Soobin, the greek god incarnation himself . You know we love you? hehehehe..
It’s funny that you mentioned that LSG looked a lot like Oh Man Seok in that particular cap. I came across a few comments of some ppl thinking that Lee Seung Gi was Oh Man Seok in the first place! hahaa.. I liked this episode because this showed Hwan’s maturity in the whole think before he acts/judges. As always awesome recap! Wow the brilliant legacy looks brilliant. You are a brilliant person to have this blog. Keep it up the good work. deeta, I have so many Jun-se screencaps I don’t know what to do with them, lol. It pains me that I can only use 2-4 per recap. *sob* But I take a lot of Hwan and ES, too. Seung-mi as well. 1) on Grandma receiving her flowers and gift. i actually teared up during the scene where she was trying it on, after not having seen her grin so widely in the past few episodes. and i’m not completely sure what will happen in the coming episodes but i’m sure as she said, she’ll prolly forget when the next winter comes. 2) BAE SOO BIN. and the whole paragraph (or more) on the would-be if he really was a practicing lawyer. i absolutely adore Lee Seung Gi but this 2nd fiddle is just too perfect! LOL, I hope his ship is as large as an aircraft carrier because of the sheer number of passengers wanting to board it! If I’m to talk, Hwan’s worst enemies are his mother and his sister as soon as he matures as the two remain the same. He falls for Eun Sung much to their chagrin because his mother is friends with Eun Sung’s wicked stepmother- both wicked witches really! 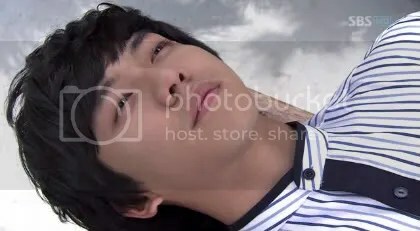 So Hwan is forced to fight against his two other blood relations (mother and sister) as he repairs his relationship with a grandmother he originally despised and mistreated for selling beef noodles unaware that’s where the money comes from. I love how Hwan and his grandmother make amends to a relationship torn by his years of stubbornness revealing that Hwan isn’t as evil as his mother and his sister. In fact, his grandmother reminds me of my English teacher who was more of a mother than a grandmother to me despite our age gap. wow . . . . . . ! ! ! I like your film . . . .
can you play for me again ? ? ? in my special day ? ? ? and I think this film is veryyyy romantic I like engseon and woo-whan send my special greet for they ! ! ! thank you I hope you read this message ! ! front page and watch how they create post titles to get viewers interested.